Swiss America Trading Corporation releases the 2016 Silver Report: The Global Metal which examines the historic “silver window” of 2016. The report explores silver’s unique characteristics as an industrial and an investment metal as well as its current affordability, broad investor appeal, endless industrial applications, steady global demand and ever growing supply gap. Swiss America Trading Corporation, a Phoenix based precious metals firm that specializes in wealth protection, has just released the 2016 Silver Report. The 2016 Silver Report: The Global Metal explores the historic “silver window” currently opening in markets around the world. The report examines silver’s unique characteristics as an industrial and an investment metal as well as its critical role in fueling some of the most cutting edge technological advancements that are helping to move mankind forward. Like most precious metals, silver’s historic run is reflective of growing economic integration in trade, capital and currency but silver holds a unique position in our new era of financial globalization. It is critical to emerging markets, evolving technologies and everyman’s opportunity to own precious metals. And in 2016, it has plenty of room to run. 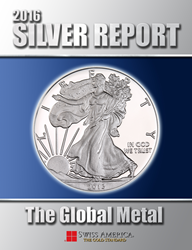 The 2016 Silver Report details the unprecedented demand for American Silver Eagles, silver bars and other coins with historic charts and compelling consumption data. The study further details the growing supply deficit by documenting the drop in silver output from producers around the globe. The report is also constructively forward-looking and provides keen insights and data points on silver’s contribution to the world’s evolving, emerging and most promising technologies. The new report presents silver as a good “bang for the buck” and a unique opportunity to hold a global metal that is at the forefront of an advancing world. The report concludes that while silver may never replace gold as the ultimate monetary metal, it offers unique affordability, broad appeal, endless industrial applications, steady global demand and an ever growing supply gap. The 2016 Silver Report is a complimentary publication of Swiss America Trading Corporation and is part of the company’s ongoing commitment to help investors make informed decisions to keep their money safe in a dramatically changing and volatile world. Register for the report at http://www.2016SilverReport.com or by calling Swiss America directly at: 1-800-289-2646. Swiss America Trading Corporation was founded in 1982 by Chairman Craig R. Smith and has grown into one of the largest and most respected asset protection firms in the industry and one dedicated to helping consumers navigate the dynamic trends that impact their savings and retirement accounts in an ever changing world.